The first building erected under the city's Special Fifth Avenue Zoning District regulations that were enacted in 1971, Olympic Tower, which was completed in 1976, introduced major mixed-use towers and glass-curtain walls and reintroduced housing to midtown Fifth Avenue. The 51-story building contains 225 condominium apartments on its top 29 floors, more than 250,000-square feet of office space on floors 2 through 21, retail space and a through-block public arcade at street level. The special zoning district was designed to prevent the avenue's transformation "from an international boulevard into a street lined with anonymous office buildings" with bank branches and airline offices dominating the retail scene. In the 19th Century, the site of Olympic Tower had been used as an orphanage by the Roman Catholic Archdiocese and was across the avenue from important Vanderbilt mansions. Subsequently, it was the site of the Union Club that is now located on the northeast corner of Park Avenue and 69th Street. In 1970, Best & Company decided to close its store in a 12-story building with a marble facade on the site and to replace it with a 45-story office building that would be developed by Aristotle Socrates Onassis, the Greek shipowner and owner of Olympic Airways, and Arlen Properties. Onassis owned the adjacent, 5-story building at 647 Fifth Avenue that had originally been a house for George W. Vanderbilt that had been designed by Hunt & Hunt in 1905. Onassis and Arlen then acquired the air rights to the former Morton F. Plant residents at 651 Fifth Avenue on the southeast corner at 52nd Street that was designed by C. P. H. Gilbert in 1905 and remodeled by William Welles Bosworth in 1917 for Cartier's. 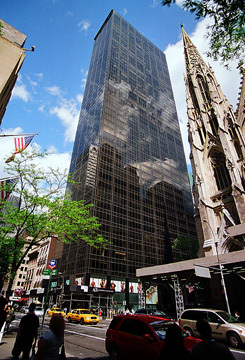 647 Fifth Avenue was taken over by Versace, the fashion designer, in the late 1990's. According to Robert A. M. Stern, Thomas Mellins and David Fishman in their great book, "New York 1960, Architecture and Urbanism between the Second World War and the Bicentennial" (The Monacelli Press, 1995), "it was rumored that the development team tried to buy the air rights to St. Patrick's Cathedral as well." Onassis and the Rapid American Corporation, which controlled the McCrory Corporation that owned Best & Co., hired Arlen to develop the property and Arlen commissioned Morris Lapidus to design the project. "Lapidus's scheme," the authors wrote, "called for a 200-foot-tall east-west mid-block slab and included a shop-lined pedestrian arcade. The arcade would be built on other acquired properties to the east of Best's, linking Fifty-first and Fifty-second streets. The scheme also included a mid-block plaza facing Fifth Avenue on a portion of the 37'6"-wide site of the Olympic Airways Building, which would be demolished. Arlen had been reluctant to hire Lapidus because of his lack of experience with office-building design, but after six other firms failed to deliver suitable designs, they gave him one week to show what he could do....His proposal was for a twenty-story shaft clad in black granite, topped by a twenty-story mirrored cube 'that bloomed like a lovely flower on its stem.' Inside the cube were to be the most prestigious offices, as well as executive apartments and a full-floor art gallery, requested by Meshulam Riklis, chairman of Rapid American. 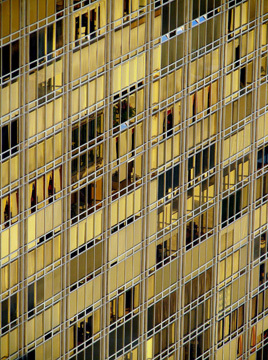 The twentieth floor was to serve as 'a huge sky plaza, an unrivaled display area for sculpture, a spacious reception area for visitors, and a congenial lunch-hour meeting place for people employed in the building.' The scheme was favorably received by Onassis and Riklis and Lapidus was authorized to develop plans." An editorial in The New York Times, however, entitled "Good-by to Fifth Avenue?" attacked the design and subsequently Jaquelin Robertson, then head of the city's Office of Midtown Planning that drafted the new special Fifth Avenue zoning district, urged the developers to make their project "a model for the future" and argued "for a less aggressive, more urbanistically conventional design, suggesting that Lapidus was not the appropriate choice," the authors continued. Lapidus was dismissed and replaced by Kahn & Jacobs and then by Skidmore, Owings & Merrill. "Although SOM was able to deliver a more sophisticated product," on the basis of the firm's previous urban buildings," the authors maintained, "they seemed less suited than Lapidus to the concept of mixed use and the functional and contextual complexities of the new zoning and the site. This impression was confirmed by the final product, an undifferentiated slab clad in brown-tinted glass....SOM's design gave no visual clues to the mix of uses it contained and made almost no effort to project a welcoming image to the public at large that was expected to populate its galleria and enter its shops....Olympic Tower's surfaces did little to enliven the street, and even though the building hugged the street line, the absence of detail and the dark glass made the shop doors difficult to find. Clear glass was eventually substituted at street level and the stores were leased to sophisticated merchants including Roberta di Camerino, an Italian shop selling handbags, the venerable leather goods purveyor Mark Cross, and H. Stern, the jewelers. The original intention was to extend the building's skin over Onassis's Olympic Airways building, but after Paul Goldberger, Ada Louise Huxtable and others protested, the limestone facade of Hunt & Hunt's original building was maintained." "Olympic Tower's curtain wall," the authors continued, "not only concealed its functional complexities, it also covered up an unusual structural system consisting of a thirty-floor cast-in-place reinforced-concrete frame apartment building atop a twenty-one-story steel-framed office structure. Apartment dwellers were provided with a high degree of amenities, including a concierge, a restaurant, a barber and hairdressing salons, emergency electric power, and saunas and exercise rooms. The two highest floors consisted of large duplex apartments. In one apartment, the international arms merchant Adnan Khashogi installed a swimming pool." The authors noted that Ada Louise Huxtable said that the building was "no design triumph," adding that "It is about as nondescript as anything that size can be." OK. The city got a rather anonymous, mixed-use building. Anonymous in the sense that its façade could be construed as monotonous and unexciting. That, of course, would be an extremely harsh judgment as the building's design by Skidmore, Owings & Merrill is quite slick, if not elegant, a kind of gigantic Seagram Building with flat facades and without the large plaza and fountains. Its proportions as a slab tower are good and its fenestration pattern excellent. The building is not a pure slab as it has a setback on its north façade and a low base wing, with its own separate elevator bank accessed from the through-block arcade, in the middle of the block on 52nd Street. Until the completion of Trump Tower several blocks to the north, Olympic tower had the highest profile of any building on the avenue because it rose without a setback on the avenue. The residential entrance is directly on 51st Street while the office entrance is in the middle of the building's arcade, which has a 30-foot-high ceiling and escalators to a concourse retail level. The project came to market about the same time as another major mixed-use tower, the Galleria at 115 East 57th Street. Despite the fact that the Galleria was in fact a far more interesting building architecturally and had a better residential location, Olympic Tower was more successful in its initial sales campaign primarily because it targeted international buyers in Europe and the Middle East, a reflection no doubt that one of the co-developers, Victory Development Corporation, was owned by a family trust of Aristotle Socrates Onassis. The tower has 38,770 square feet of retail space as compared to about a quarter of a million square feet that were contained the Best & Co. building that had been on the site. An underground connection beneath Fifth Avenue to Rockefeller Center was considered, but rejected as too costly. The building's arcade disappointed a lot of city planners who eventually insisted on better signage to alert the public to its presence and subsequently the arcade was substantially redesigned. The designers involved in the arcade's evolution were Chermayeff, Geismar & Associates, designers, and Zion & Breen, landscape architects, and Levien, Deliso & White, designers, and Abel & Bainnson, landscape architects. The arcade has a south-facing, multi-tiered waterfall and a café. The tower's arcade has not always been successful. When its waterfall is in full cascade, which is not always, and the café is full, it is a nice experience, but the overall appearance of the arcade is a little drab and dated and needs some freshening. The views from within the tower are stunning. On the one hand, its dark bronze-colored façade both provides a strong contrasting backdrop for views of the cathedral from the south as well as reflections of it. On the other hand, the tower blocks much of the view of the tower's twin spires from the north. 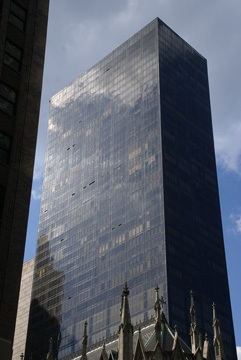 Olympic tower's tall slab is vastly superior to that of the New York Palace Hotel behind the cathedral on Madison Avenue, but a more ideal, though not realistic solution suggested by the fine, white, 38-story Swiss Bank Tower at 10 East 50th Street that is set back behind Saks Fifth Avenue, which expanded into it, and does not impinge on the cathedral. Perhaps sometime in the next millennium when Olympic Tower's site is redeveloped they will remember to set the new tower back from the avenue to once again free the glorious towers of the cathedral to more views. At its topping-out ceremony, city planners were invited to hear some short speeches and gobble boiled red potatoes stuffed with crème fraiche and the finest caviar and drink some very good champagne. It was an impressive start for a tower that is still impressive by any standard close to the epicenter of the world. The best views, of course, are of the cathedral's spires. Olympic Tower is slick and a major example of the Modernist aesthetic in the city. 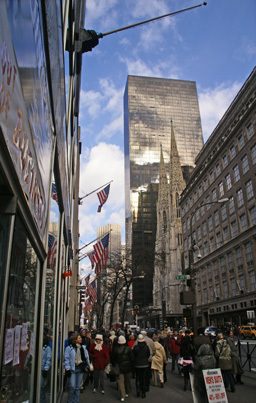 While it is true that the prior design by Lapidus, who was best known for his flamboyant hotels in Florida, was very intriguing and exciting, especially for its time, the current tower was a pioneer in mixed-use building in the city and its "undifferentiated" south facade presents a clean backdrop for views of St. Patrick's Cathedral from the south. The exterior of the corner store at Fifth Avenue was reclad in bright, silvery metal in 1998 and while such a treatment might have seem to be very much in conflict with the building's bronze-color facades, it is very elegant and handsome.